Today marks a very special celebration. 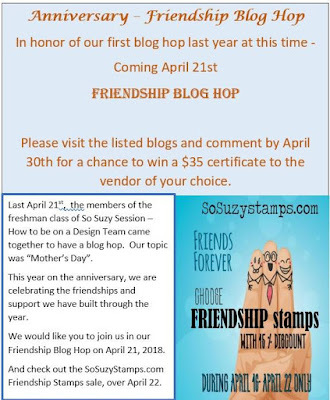 Last April 21st, the members of the freshman class of So Suzy Session – How to be on a Design Team came together to have a blog hop. Our topic was “Mother’s Day”. This year on the anniversary, we are celebrating the friendships and support we have built through the year. for a chance to win a $35 certificate to the vendor of your choice please visit every stop on the hop and comment by April 30th. I have been making lots of square cards lately - it was time for a little change from the usual card shape and size I make :) plus it's fun to mix in a variety of shapes and sizes. If you wish to check out the sale at So Suzy Stamps you can click here. 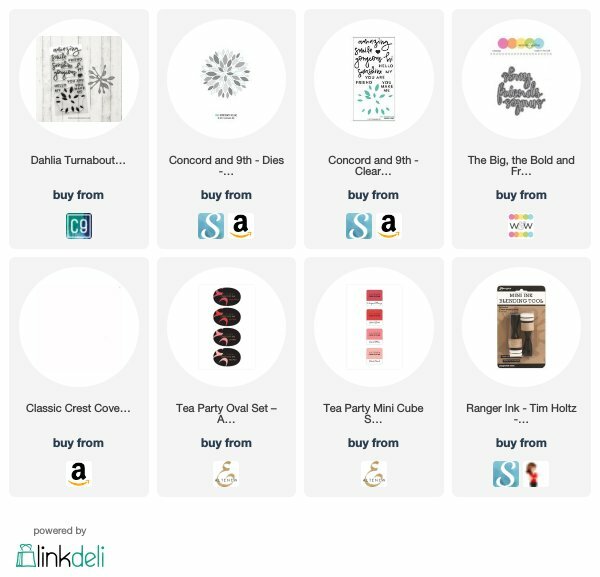 Concord & 9th has several "flavors" of turnabout stamps, which are among my favorite stamp products. They are made to be used with a stamp positioning tool - my tool of choice is the MISTI. You create the stamped image by turning your paper one quarter turn in which you can stamp up to 4 times in different colors. The key to making it work is to use a temporary adhesive to hold your cardstock to a 6" x 6" template and turn the entire template one quarter turn before stamping again. I stamped a different color (progressively lightest to darkest color from the ink set) on 3 turns and used the optional die instead of stamping the 4th time. I used an ink blending tool to apply the darkest color from this Altenew Tea Party ink set onto a separate piece of white cardstock to go underneath the stamped panel. I popped up the white stamped panel to give some more dimension for the "peekaboo" effect. 4.5" x 4.5" square top fold card base made from 110 lb white cardstock. 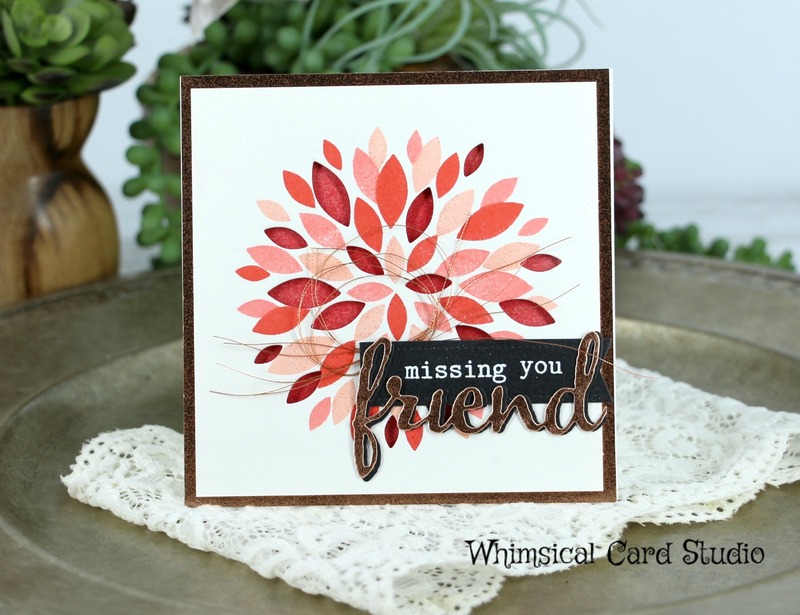 die cut the word "friends" from a Winnie & Walter die set out of the copper cardstock and black cardstock, adhered the copper die over the black one, slightly offsetting to create a shadow. cut off the "s" to go better with the rest of sentiment. stamped "missing you" sentiment from this Winnie & Walter stamp set with Versamark ink onto a small piece of black cardstock. added white detail embossing powder on top of the wet ink and heat set. trimmed down the black cardstock and cut a v shaped tail on one end. PRIZE INFORMATION: Visit and comment on each blog by April 30, 2018 for a chance to win a $35 gift certificate to the vendor of your choice. Winner will be announced approximately May 1st on Mary Kay's blog. Very pretty! The turnabouts take a little practice (for me anyway!) but are so worth the effort! I agree they do take some practice - thanks for stopping by Avra! This is such a neat stamp. I like the variety of colors. I need to give these turnabout stamps a try. Love the color combination for the stamp! and yes square cards are sometimes more fun (more space to work)! hope you do enjoy making more and sharing! I love the results with the turnabout stamp! I will have to try it out. Beautiful card! Love this set and I love the colors you used with the copper thread. So pretty! What a fantastic card !! Those turnabout stamps are really awesome ! !